One of the more pompous claims of the MSM – in asserting their moral supremacy over the blogosphere – is that their stories are checked for factual accuracy by the legions of journalists, subs and editors, whereas mere bloggers can just post anything they like on the web, right or wrong. One such story was undoubtedly the front-page scoop in the Sunday Times yesterday, revealing that "laws that threaten the British 'pinta' and traditional loaf of sliced bread are set to be waved through the European parliament this week." This is precisely the sort of story, you would think, that is meat and drink (or bread and milk?) to our site but, knowing from experience that the claims of the MSM so often as empty as their stories, I held back until I had time to check it out. Being rather busy checking the facts for one of my own stories, it wasn’t until today that I got down to the task and, sure enough – as some instinct had warned me – the story is utter garbage. Far from banning the "pinta" as the Sunday Times asserts, what we are dealing with here is a rather boring piece of technical legislation, a directive "laying down rules on nominal quantities for pre-packed products, repealing Council Directives 75/106/EEC and 80/232/EEC, and amending Council Directive 76/211/EEC". Its purpose, far from banning the "pinta" is to remove the requirement to sell a whole range of products in specific quantities. 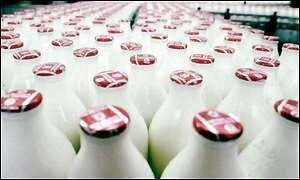 In effect, therefore, the proposal removes the statutory requirement to sell milk in pints (this only applying to doorstep milk anyway), which is a far cry from banning it. Nevertheless, this did not stop the Sunday Times launching into a fantasy of its own making, reporting, "Dairy farmers and British MEPs are fighting a last-ditch campaign to block the moves to harmonise packaged food across the European Union." Then, to make its story, political editor David Cracknell rang up Mr Renta-Quote himself, Christopher Heaton-Harris, the Tory MEP, who – as he so often does - added his own tuppence-worth of garbage, demonstrating - as he so often does - that he did not have the first idea of what was going on. This morning, the BBC website rode to the rescue of the EU, headlining "No EU threat to pint of milk" after having contacted a spokesman for the European Parliament in London. The only outcome of this story, therefore, is to give the EU commission more ammunition to support its own claim that the British media does nothing else but peddle "Euro-Myths", while reinforcing the MSM's increasingly deserved reputation for producing garbage. Fact-checkers, they are not. What kind of European Union? Eat your hearts out boys! Does she ever stay at home? Conservatives win election – shock! Is there any limit to their fantasies? Ah ça ira, ça ira, ça ira …. I’m well and truly Googled!! Are we talking about the same man?